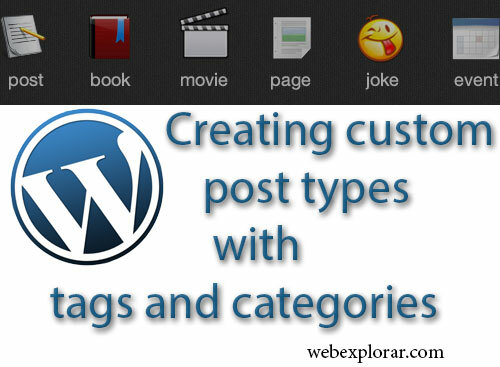 If you’re working with wordpress sometimes you want to add custom post types with it’s tags and categories to add into admin panel.For a example, “News” custom post type.You can follow this tutorial guide to add unique custom post types with it’s tags and categories to admin panel.No errors,no tags and categories mixing with other post types.No usages of plugins. Now we’ll see how to add custom post type to wp admin panel. -First you must go to the theme folder and open the functions.php file.If you’re using premium themes you can use custom-functions.php or theme-function.php. -After that at the end of the file put the following piece of code.Here I’m using “News” custom post type. 'menu_icon' => 'dashicons-format-aside', // change your menu icon from here. register_post_type( 'news' , $args ); // News Post type name here. After add the above code you can see the changes as following. If you want to add custom menu icon go to following link and select the icon.Then copy it’s name(Ex:-dashicons-format-aside) and put here. Main part is finished.Now we’ll add it’s categories.Note here,I’ll explain little bit mistake many user’s doing. If you add following mentioned code, you can see categories mixing with other post type’s,default post’s categories.So DON’T USE Following code. ‘taxonomies’ => array(‘category’) ,// mixing with others. This is the correct code. Now we have to do the customize columns as the following diagram. Add the following code to functions.php file. Filter news and sort by name. To do that add this code. Adding Tags to Custom post type. You can add following code to add tags to News post types.No mixing with other post types. Now you have implemented all codes and after that you can see custom post types with tags and categories,sorting,filtering functions. May be when you visited to the category page you may not be seen the post related to that category. To fix this add the following code to function.php file. If you want to add more admin menu icons then add this code to functions.php file. Follow my another post describing this. If you have wordpress blog sometime you faced to this error. All wordpress widgets are displaying properly.After clicked on the each widget’s options are not opening.Another issue is widgets are not displaying.Menu items are not displaying when mouse hover.And other error is can’t drag and drop wordpress widgets. So in this post is describing how to solve these issues. There are the errors in the admin panel. After clicked on the each widget’s options are not opening. Can’t drag and drop widgets. Menu items are not displaying when mouse hover. How to fix these issues? There are some methods to fix these issues. Disable all plugins and check it.If not success sign out again.If success, the reason is plugins conflicting.Enable one by one and detect the plugin and try to update it. Apply twenty twelve or twenty eleven theme and check.If success, the reason is in your current theme.Try to update or find the solutions. If displaying you can identify what the errors. Check the jquery library file is loaded into the admin panel.If not exist, add it. Better way is add “Use Google Libraries” Plugin.Then lot of issues are fixing. Download Use Google Libraries from here. 1-Go to the root folder and open wp-config.php file. 2-Copy and paste the following script end of the file and save it. 3-Check the admin panel for issues. Hope this will be help to solve these issues! Woothemes also comes with some basic SEO settings with in.Yoast makes a great plugin called WordPress SEO. Unfortunately they don’t always play nice even if you don’t use the Woothemes SEO functionality. Woothemes and Yoast SEO displying double title separators.I’ve been having a problem with my titles showing double title separators. You can understand this by following image. If you’re using google xml sitemap wordpress plugin(Google sitemap generator,google-xml-sitemaps-v3-for-qtranslate,..etc), you will notice an error message when you’re accessing your sitemap.This error message like this.